Group Ride to DADA’s Fall Gallery Walk, September 22nd! 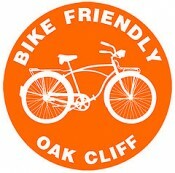 Cyclists of all age levels and abilities are invited to the Dallas Art Dealers Association and Bike Friendly Oak Cliff’s Bike Swarm as part of the DADA Fall Gallery Walk on Saturday, September 22, beginning at 1:30 p.m. at DADA member Oak Cliff Cultural Center, 223 W. Jefferson Boulevard. The event is free and includes a choice of a guided or self-guided tour of the art galleries located in the Design District, with free refreshments provided by Royal 60. We will leave the OCCC at 2 p.m. and ride together (4.2 miles) to the parking lot of Royal 60, 150 Turtle Creek Boulevard in the Design District, for refreshments provided by Wendy Krispin. Then riders can visit area galleries on their own or follow DADA Director Lisa Taylor. Those who choose to can meet up again at 5 p.m. Royal 60, 150 Turtle Creek Boulevard before heading to the Turner House, 401 N. Rosemont Ave., for its exhibition: “100 Years of Oak Cliff Art”. Cyclists are advised to bring locks. For more information, call 214.914.1099 or e-mail info@dallasartdealers.org. Here’s a map of the route!